Description: Sixteen Foot Granite monument. 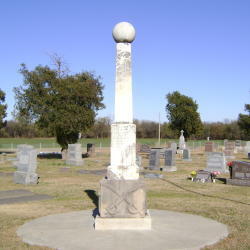 The front has a bronze plaque affixed to it, inscribed: "In Memory Of The ~ U.S. ~ Soldiers, Sailors ~ And Marines ~ Of The ~ World War Of ~ 1914-1918 ~ Erected By The ~ John Knowles Post ~ American Legion ~ Of Honor ~ 1921". Below that an inscription in the granite reads "Erected May 30, 1898". 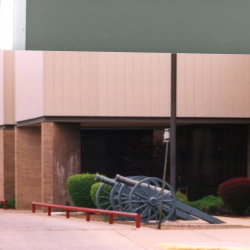 The Base is inscribed "G.A.R.". 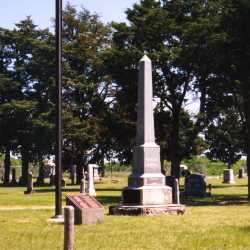 The back of the monument is inscribed: "In Memory Of The ~ Union Soldiers ~ And Sailors ~ Of 1861 - 1865". 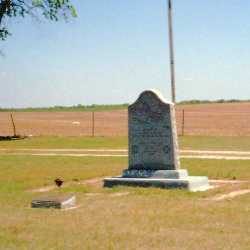 This monument is reported to have been erected by Post 337 at a cost of $250, raised by popular subscription. 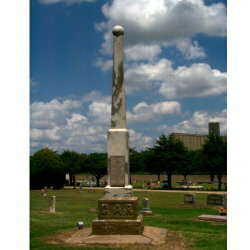 Description: A monument in the cemetery is inscribed: "In ~ Memory Of ~ Our ~ Unknown ~ Dead ~ May They Rest In Peace ~ 1861 - 1865". Below that is a bronze plaque reading: "Dedicated To ~ The Soldiers And Sailors ~ Of All Wars ~ By The ~ Edwin Ricord Post 135 ~ American Legion ~ May 30, 1929". The reverse is inscribed: "Erected ~ By ~ Upton Post ~ No 27 ~ G.A.R. ~ And ~ W.R.C. ~ No 35 ~ In 1906". Description: : The central spire is engraved on one side with "To The ~ Memory Of ~ Our Fallen ~ Heroes Who ~ Lie Buried ~ In Unknown ~ Graves". The other three sides contain names. The upper part of the base is engraved with "W.R.C". 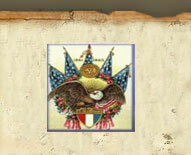 "GAR", "1861" and "1865". The bottom part of the base has an anchor, crossed swords, crossed sabers, and crossed canons. 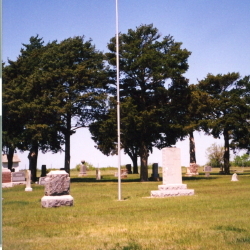 Description: A granite monument and a flagpole are located in the middle of the cemetery. The monument is inscribed: "To The Glory Of God And In Memory ~ Of Those Who Served Their Country". Under this is inscribed: "Civil War (11 names) ~ Spanish American War (1 name) ~ World War I (15 names), Korean (7 names), World War II (18 names)". Below the names is inscribed: "Dedicated 1969". This continues on the reverse with "World War II (8 names) ~ Vietnam (1 name) ~ (14 additional names)". Below the names is inscribed: "Donated By Friends & Relatives ~ May 30, 1969". A marker at the base of the flagpole is reads: To Those Men Who ~ Served In All Wars ~ Dedicated June 1, 1967 ~ Donated By Edwin M Shobe Family". 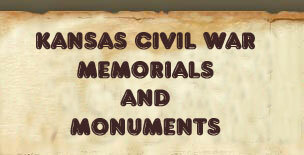 Description: Twin monuments are mounted on a common concrete pad. 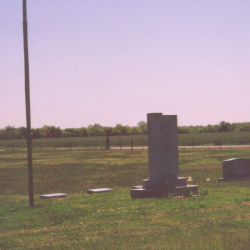 The left monument is inscribed: "In Memory Of ~ The ~ Mothers, Grandmothers ~ Sisters, Daughters ~ Wives, Sweethearts ~ And Lady Friends ~ Of The Soldiers Of ~ 1861-1865 ~ Who Saved The Union ~ And Freed The Prison ~ Ers Who Were Bought ~ And Sold Like Cattle. ~ Erected By ~ J.M. Buffington". "1861-1865" is below this inscription. 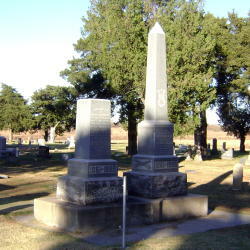 The right monument top has an engraving of a GAR medal. Below this is: "To The ~ Memory Of ~ Our Heroic Dead ~ Erected By ~ J.M. Buffington ~ Co. D, 32nd Iowa ~ First White Man To Cross ~ The River And Settle In ~ This County Apr 1870" "1861-1865" is below this inscription. Description: A monument in the cemetery is inscribed: "To The Glory Of God ~ And ~ In Memory Of ~ Those Who Served Their Country". At the bottom is inscribed "Donated By Friends And Relatives." 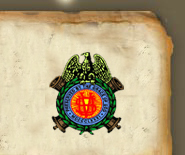 The reverse lists 59 names and "Dedicated 1971". Description: A monument in the cemetery is inscribed: "Dedicated To ~ The Veterans Of All Wars ~ Who Gave Their Lives That We Might Live ~ Veterans Of Foreign Wars ~ To The Glory Of God ~ And ~ In Memory Of ~ Those Who Served Their Country".